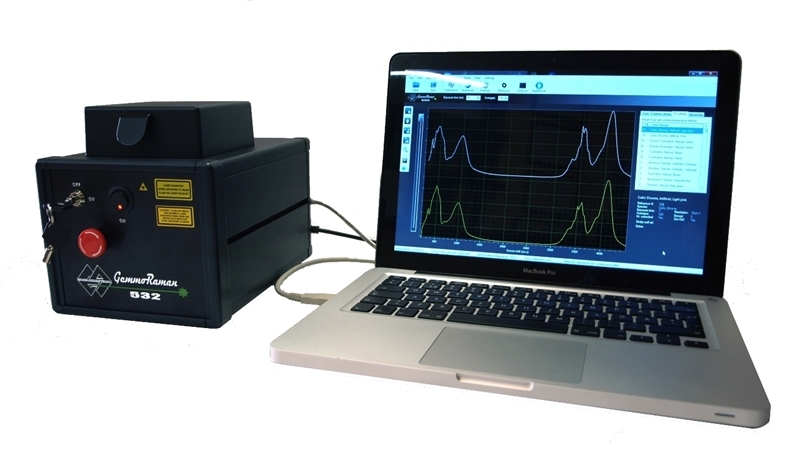 M&A Gemological Instruments Ltd Announces Release of GemmoRaman-532™ - world's first fully automatic Raman & Photoluminescence spectrometer for gemological analysis. Helsinki, Finland September 19, 2012 - MAGI announced the debut of their new affordable Raman spectrometer, an instrument specifically developed for the purpose of gemological analysis. This new product - available immediately - brings one of the most powerful, advanced analytical tools to the desk of individual gemologists, small gem labs and educational organizations, enabling the positive identification of gems and their imitations. "Every aspect of both hardware and software has been carefully thought out. The spectrometer construction and materials are high quality. The software is easy to use, and the spectral database is an invaluable resource." - says Brian Thompson, Ph.D., Professor of Physics and researcher at the University of North Alabama, who has had the opportunity to see first produced units in operation. GemmoRaman-532™ is a unique dual-purpose analytical product with the ability to focus automatically on a sample, optimize the necessary acquisition parameters, compare the results with included comprehensive spectral libraries and then display results. Most gems and imitations can be analyzed and positively identified with only one mouse click using the AutoScan feature. Sample preparation or previous experience with Raman units is not required. "This is the first time such a complete tool is available for gemologists and small gem labs at an affordable price. We have developed proprietary software to satisfy both newcomers and more demanding experienced users. ", says Mikko Åström FGA, Project Manager of MAGI and continues "The gem being studied is laid table down to the sample stage and the lid is closed. If you know how to use reflectometer you know how to use our product". If further matching tests are needed, a special feature allows the user to automatically export the spectra to the freely downloadable CrystalSleuth software in order to compare it to more than 5000 reference spectra in the mineralogical RRUFF database. While it's main purpose is gem identification, it has numerous applications for separating synthetic materials, detecting treatments and enhancements. An adjustable sample stage allows the user to customize depth of focus for specific applications such as Photoluminescence examination of diamonds immersed in liquid nitrogen. Unlike other similar instruments, requiring restricted areas for use and protective eyewear, the GemmoRaman-532™ is fitted with an enclosure and safety interlock system enabling its use in any location without the need for protective goggles. 250-4500 cm-1 extended range gives the unique opportunity to acquire both Raman and Photoluminescence spectra and compare them to the two dedicated spectral libraries embedded in the software. Libraries will be continuously updated and freely distributed to owners via Internet. With a very compact footprint, the lightweight GemmoRaman-532™ is easily portable. "One of the main challenges of the project was to build the unit extremely compact, safe and easily transportable, we’re very glad to say we have succeeded!”, says Alberto Scarani GG, Marketing Manager of MAGI. GemmoRaman-532™ system is now available for 7,350€ FOB Helsinki, Finland. MAGI is part of the Finnish company Foral Design Oy, founded 2000. The company and production facility is located in Järvenpää, Finland.